Pooch & Mutt Mobile Bones Canine Joint Supplement is rich in Glucosamine, MSM and Omega Oils; each identified for their aid in the formation of healthy cartilage, synovial fluid, ligaments, tendons and muscles. Expertly blended, this supplement provides a natural, kind way to encourage healthy joints in dogs. 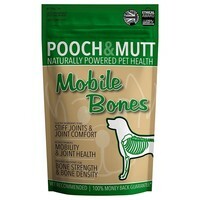 Pooch and Mutt also recognise the importance of strong, dense bones when promoting mobility. Therefore, Mobile Bones is enriched with calcium alfalfa as well as being a rich source of high-quality protein. The benefits of Pooch & Mutt Mobile Bones Canine Joint Supplement can be seen within 3 weeks however this may differ from dog to dog. My eight year old rescue GSD has hip and elbow dysplasia. As well as her daily pain medication I have tried a few joint supplements but Mobile Bones is the only one that has made a noticeable difference to her - I have seen a definite spring in her step since she has been taking it. Recommended. Mobile Bones is amazing.My Lab has Bilateral hip and Bilateral elbow dysplasia.Also he was born with Arthritis.Since we have been giving him a daily spoonful of MB he is a different dog.He now goes for walks,plays with toys and does not spend his days sleeping because he is so stiff and has painfull joints...Try it..as I am convinced you will not be disappointed.No connection with the company just a very happy 9 year old Labrador's owner .